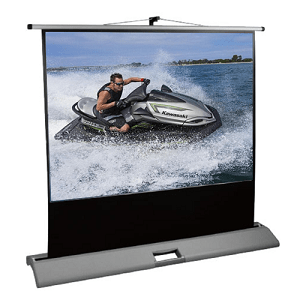 This medium-sized, tough 1.8m wide screen is suitable for presentations to groups of up to 25. It should be considered for most applications including rental use. The PC Series pull-up screens are made tough. They feature a rugged metal housing with the handle built in. The screen is supported by a pole which is clipped to the underside of the housing. They can be transported in medium sized and larger vehicles (even a ute) and the wide base means that it is stable enough to be used on most surfaces. The screen surface is 1.8m wide in 16:10 format. Measured diagonally this is 84 inches. The packed size of the screen is 194cm long by 25.5cms wide by 14 cms high. This screen weighs approximately 14 kgs. The screen housing is white powder coated metal alloy. These screens come with a 12 month warranty. An extension of this warranty to 3 years is available separately. Spare parts are maintained in our Australian warehouse.